WATCH LIVE MONDAY: Live streaming coverage of the North Korea Summit Monday starts at 7 p.m. EST on ABCNews.com or on the ABC News app available on the Apple App Store, Google Play Store, Apple TV App Store, Amazon Fire TV and Roku Channel Store. After months of on-again, off-again speculation and high-stakes closed-door meetings, President Donald Trump will sit down with North Korean leader Kim Jong Un for a historic summit in Singapore on Tuesday. It's the first meeting between leaders of the two countries, which are technically still at war with one another and in a tense nuclear stand-off over North Korea's illicit nuclear weapons program. The meeting on Tuesday has the world on edge -- will it be a breakthrough moment with two leaders uniquely suited for the moment, or will it end disastrously and inch the crisis closer to war? "We are going to have a great success," Trump pledged Thursday at the White House. But it's unclear what success is to Trump –- or Kim. 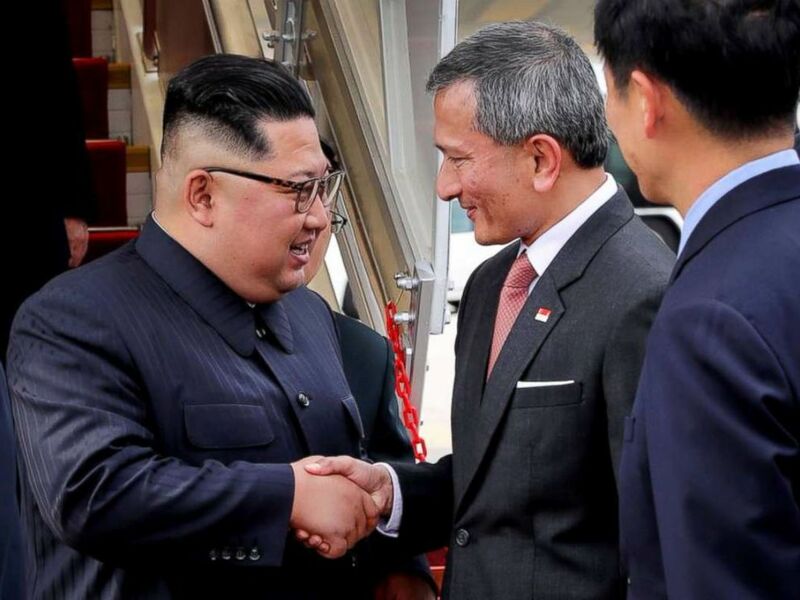 The logistics of the summit have been painstakingly hammered out by U.S. and North Korean delegations, meeting in Singapore over the last couple weeks. White House Deputy Chief of Staff Joe Hagin has led the U.S. team as they determined key details of protocol -- such as who walks in the room first, who gets a seat at the table, and where the meeting will be. White House press secretary Sarah Sanders announced last week the Capella Hotel on Sentosa Island as the location. 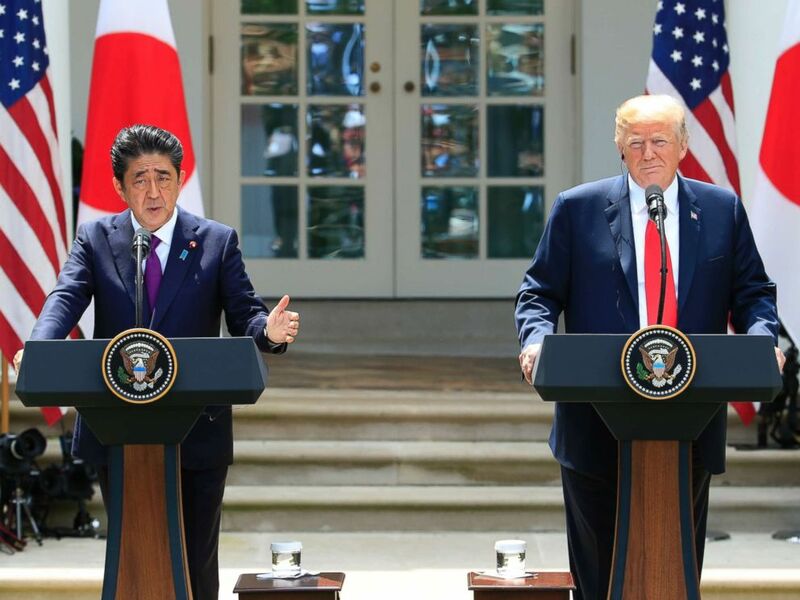 Japanese Prime Minister Shinzo Abe with President Donald Trump speaks during a news conference in the Rose Garden at the White House in Washington, June 7, 2018. Sentosa is a small resort island just off Singapore's main island, likely chosen for its isolation and controlled access, as security has been a key priority for both sides. In particular, North Korea is said to be concerned about assassination attempts against Kim, who is traveling further away from North Korea than he ever has. Ironically, it was just across the border in Malaysia that Kim's half-brother was poisoned and murdered, allegedly at the North Korean leader's command. The Capella Hotel is a luxury resort that covers 30 acres with 112 rooms, suites, villas and manors; over 24,500 square feet of meeting spaces; and, perhaps most importantly to Trump, two 18-hole golf courses nearby. The delegation list is small, with some of Trump's most important advisers, Vice President Mike Pence and daughter and White House adviser Ivanka Trump, staying in Washington. Instead, he will have Secretary of State Mike Pompeo and National Security Advisor John Bolton at his side -- two men who have taken very different strategies to North Korea. Bolton repeatedly referenced the "Libya model" when discussing North Korea -- angering North Koreans who see it as a threat against Kim. 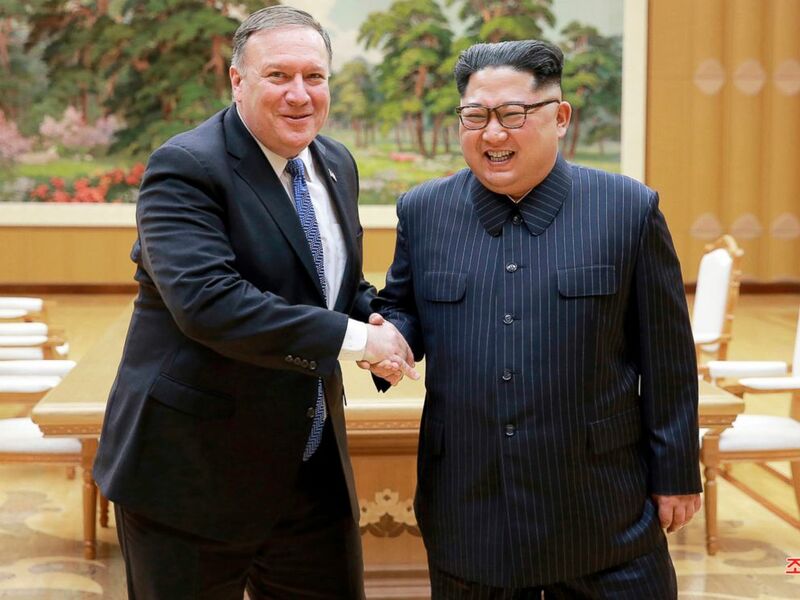 Since then, Pompeo, who has met with top North Korean officials three times and Kim himself twice, has been the point person and a strong advocate of diplomacy. He denied reports of their disagreement as "unfounded and a complete joke," but he added they "will disagree with great, great consistency." No one knows what happens after Trump and Kim leave the room Tuesday. The president and his top officials have been trying to temper expectations for what that first meeting will achieve, with Trump noting it could be a multi-day summit and more recently repeatedly telling reporters it will be a "process." "I don’t think it will be in one meeting. I think it will take longer than that," Trump said Thursday at a press conference with Japanese Prime Minister Shinzo Abe. Secretary of State Mike Pompeo, left, shakes hands with North Korean leader Kim Jong Un during a meeting at Workers' Party of Korea headquarters in Pyongyang, North Korea. Still, to be successful, something must come out of the summit, and that's the work of U.S. and North Korean meetings in Panmunjom in the Demilitarized Zone between North and South Korea. There, a U.S. team led by Amb. Sung Kim, the envoy to the Philippines and former Special Representative for North Korea Policy and nuclear negotiator, has been negotiating a communique with North Korea -- a formal document for the two leaders to sign. Trump alluded to the terms of that agreement, saying Thursday it could include a formal end to the Korean War. "We're looking at it," the president said. "We're talking about it with them." But it seems normalizing relations with North Korea would not be an immediate step after the president said it would come "when everything is complete." Pompeo seemed to say that what comes out of Tuesday's meeting will be a framework, telling reporters, "We can't step through this over years, but rather need to acknowledge it will take some amount of time, that this doesn't happen instantaneously." 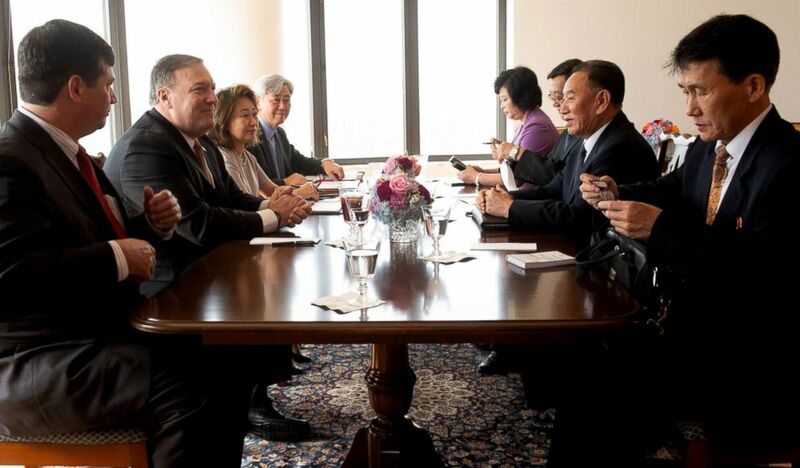 North Korea Vice-Chairman Kim Yong-chol, right, meets with United States Secretary of State Mike Pompeo, left, May 31, 2018 in New York. The skeleton of that framework is clear: the U.S.'s security assurances and normalized relations for North Korea, in exchange for North Korea's complete, verifiable, irreversible denuclearization for the U.S.
"The best possible outcome I see for this summit is a general outline of an agreement that identifies denuclearization as the end goal of a process to be determined," said Suzanne DiMaggio, a senior fellow at the think tank New America who facilitated the Trump administration's first talks with North Korea in 2017. Beyond that basic framework, there are other important next steps that could facilitate continued discussions. Among them is the idea of sending U.S. diplomats to Pyongyang and North Korean officials to Washington, which "would be a real demonstration of a commitment to this process, that could be done quite easily and, at the same time, have the practical point of solidifying the channels of communications as well," according to DiMaggio. For others, the bar for success is higher or more definitive. The Ploughshares Fund, a philanthropic foundation focused on nuclear nonproliferation, agreed the summit would be the beginning of a process, but called for three specific steps: North Korea taking "near-term" steps to denuclearize, including opening itself to inspectors and formalizing its freeze on testing; North Korea taking "long-term" steps, such as dismantling its facilities and allowing for "intrusive verification"; and the U.S. and others providing phased incentives, like easing sanctions and supporting a peace treaty. "These first-stage actions, accompanied by an agreement on full verification, will test the seriousness of Kim's claim that he is seeking a different type of relationship with the United States, as well as [South Korean] President Moon's claim that the U.S. should believe it," Amb. Joseph Yun, who was the special representative for North Korea policy until February when he retired, told Congress Tuesday. The administration has refused to comment on specifics in order to give Trump and his team space to negotiate, officials have said. WHAT COULD DERAIL THE SUMMIT? The challenge, however, is that within that basic framework, the two sides have different opinions on timelines and definitions that will be key to bridge. In particular, the Trump administration had been demanding that North Korea take concrete steps to denuclearize before any sanctions relief or other concessions. But North Korea has been adamant about a "phased approach," with Kim saying last week denuclearization "will be solved on a stage-by-stage basis." 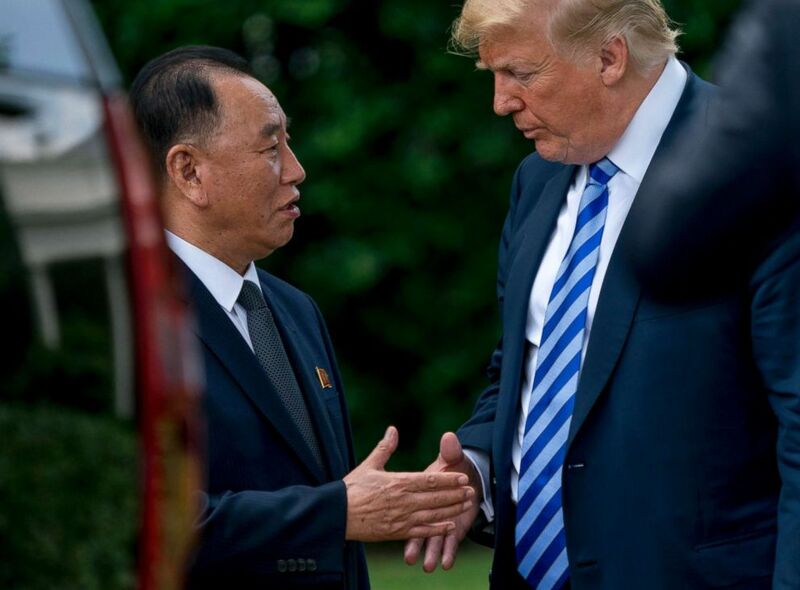 President Donald Trump shakes hands with Kim Yong Chol, former North Korean military intelligence chief and one of leader Kim Jong Un's closest aides, as after their meeting in the Oval Office of the White House in Washington, June 1, 2018. More recently, Trump has seemed from what Yun called an "unrealistic" demand towards a gradual "process" -- a word he used nine times when speaking to reporters after meeting with Kim's chief negotiator, Kim Yong Chol, at the White House last Friday. Still, the danger remains that if the two leaders cannot find agreement, then no one can -- and where does that leave the world? 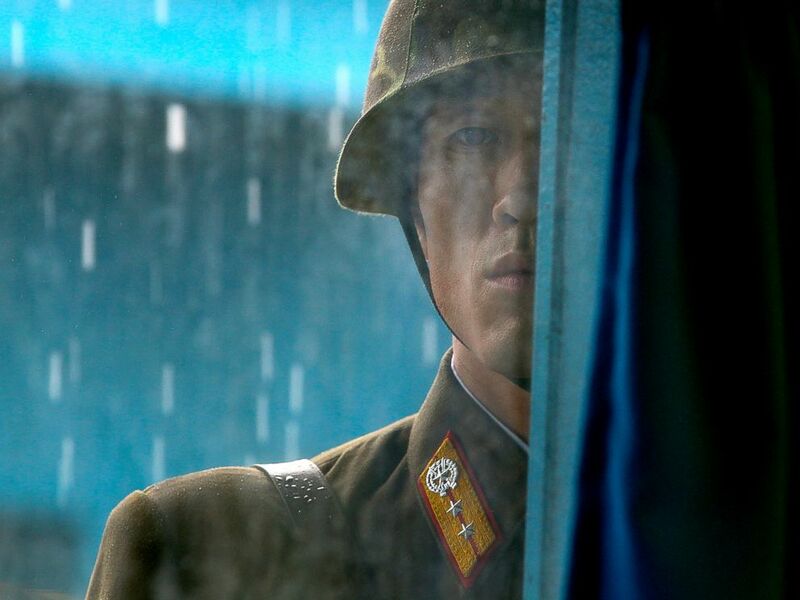 If "negotiations break down, North Korea returns to its pattern of behavior in 2017 when it conducted 20 ballistic missile tests and one hydrogen bomb test, the United States ramps up military exercising and pre-positioning of assets, the 'fire and fury' rhetoric heats up again, and the potential for armed conflict -- even nuclear conflict -- becomes very real," said Victor Cha, a senior fellow and the Korea Chair at Center for Strategic and International Studies who was once Trump's leading pick for U.S. ambassador to South Korea -- a post that still remains vacant. It's also precisely because the entire peace process revolves around coming to an agreement on these points that the leaders should meet -- and be successful -- according to some analysts, including Cha. "Trying to close the gap on disparate definitions of denuclearization requires an early meeting with the regime since there is only one person in the North Korean system who can make such a strategic decision," he told Congress Tuesday. Either way, as Ambassador Robert Galluci, chief North Korea negotiator under President Bill Clinton, said Monday, "June 2018 is better than June 2017" -- on the potential precipice of peace after "a year of being what seemed to me hours to days against a possible second Korean War."